I thought I would take a minute to tell you about a rock band that I used play in back in 1997-98. The band was called "The Know" consisting of Rob Dickson - rhythm guitar/vocals, Pete Meharg - lead guitar/vocals, Rich Scarsbrook - drums/harmonica/vocals, and me, Ron Behro - bass guitar/sound mix. Even though I play electric guitar, I joined the band to play bass guitar instead. I actually took over for the previous bass player Doug Springstead who decided to go back to his other band exclusively. For a couple of years "The Know" played in and around Sarnia and Lambton county and having a good time at it. We played mostly cover songs except for a select few original songs written by our drummer Rich Scarsbrook. We would usually include one original song in each of the standard three sets each night. One night at The Pumphouse bar in Petrolia, Ontario we decided to bring along a cassette deck and record one of our shows just for the fun of it. After that gig the tape got put on the shelf and forgotten about. Soon after the band separated due to our various schedules and life getting busy. We still remained friends - no bad feelings or anything. Five years later or so, I was talking with Pete Meharg our lead guitarist and wanted to know whatever happened to the tape I had recorded that night at The Pumphouse back in '98? Pete called me back and said that he had the original cassette tape at his place. Pete took that tape and transferred those original songs that we played live onto his computer and then made a few CD copies few us to have. For me, I was happy to get the disc because, it just reminded me of the all the fun I used to have playing in the band! I can also remember all the energy in the room that night at the bar with a full crowd watching us play. Last year I decided to create a myspace.com music page and feature the music of "The Know" for everyone to hear. Unfortunately, I didn't have a copy of the original band poster advertising that original gig so I just added a picture of Victoria Playhouse Petrolia, the theatre in town just one street over from the bar. The VPP is where I used to work as the House Theatre Tech and where I first met the guys in the band. The original lineup of The Know with bassist Doug were playing in the Petrolia Variety Show '96. I did the sound for the performance. In the original program for the show, the guys were listed as - The "Wish We Had A Name" Band. It was the truth, that hadn't decided on a name yet. For your listening pleasure, I invite you to go to the myspace music page for our band "The Know" and take a listen to all three songs posted. Let me know what you think. The songs are now 11 years old! Oh, and one thing, I personally wrote the guitar riff for "Little Spaces" but, played the bass instead. 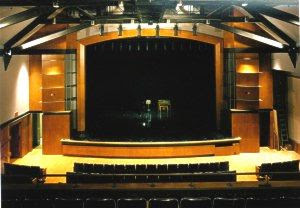 Just for fun I have a picture of the stage at the Victoria Playhouse in Petrolia, Ontario. I spent 3 years from 1993 - 1996 working as the Head Theatre Tech. One of the most intimate theatre venues I have ever worked in! Take a look.